Circumstances leading to the derailment is at this stage unknown but rail authorities and the police are on the scene. 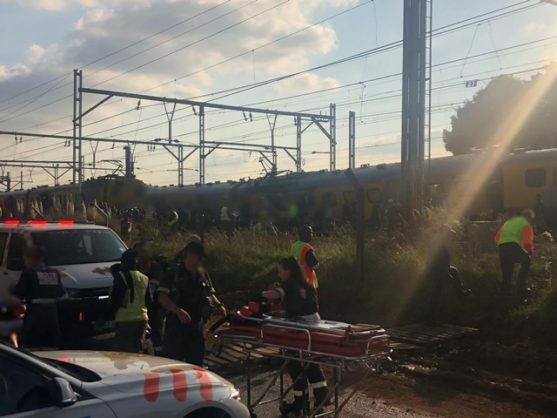 Sixteen people were injured on Tuesday when a train derailed at the Elandsfontein train station off Jet Road in Boksburg, paramedics said. Netcare 911 spokesperson Shawn Herbst said paramedics responded to reports about 4.19pm of a train collision at the Elandsfontein station. “On arrival paramedics assessed the scene and found that three carriages of a train had derailed injuring sixteen patients. All the injured were occupants of the train and sustained injuries ranging from minor to moderate,” Herbst said. Metrorail confirmed the derailed train on Twitter at 5.36pm. Metrorail and the police were not immediately available for comment.